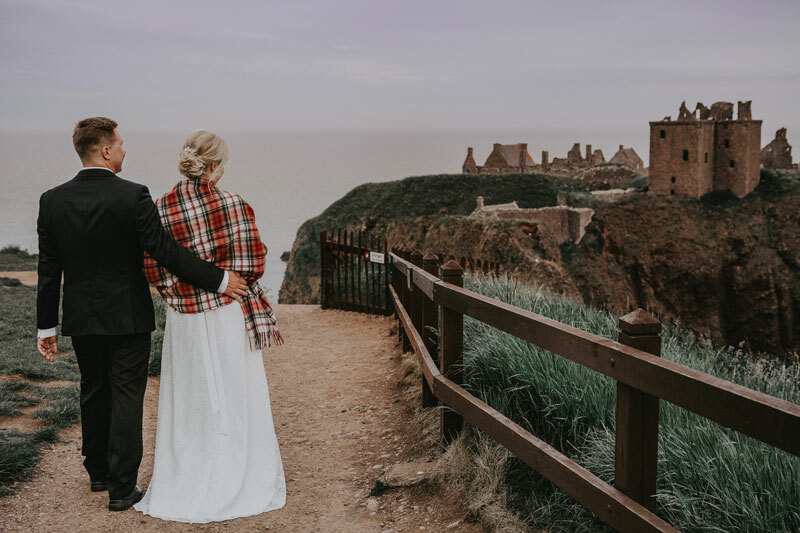 I was very fortunate to be asked to photograph Niko and Milla’s Dunnottar Castle Wedding. 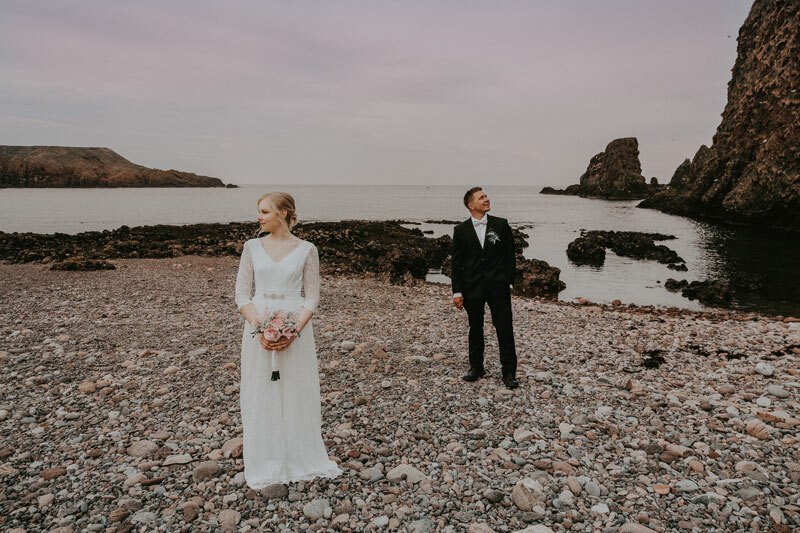 They had chosen this stunning place for their Scottish elopement. 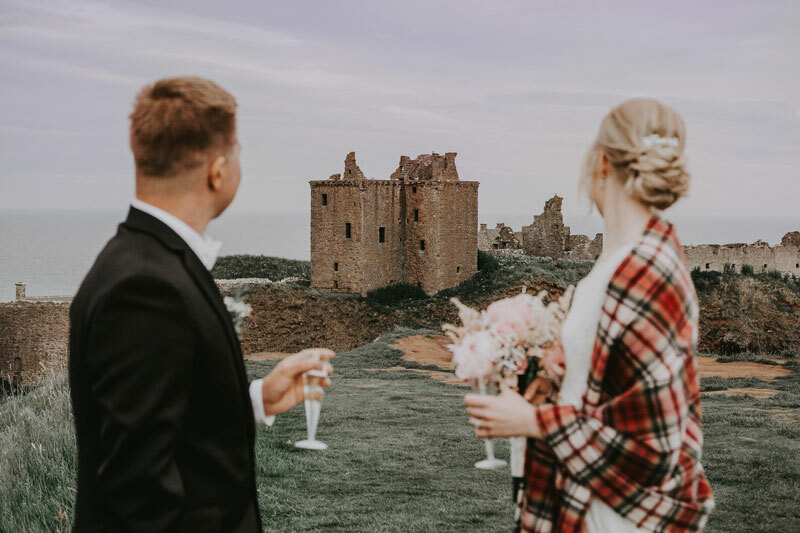 The castle ruins are located right on the cliffs edge surrounded by the sea, and as you can imagine the views are just breathtaking. 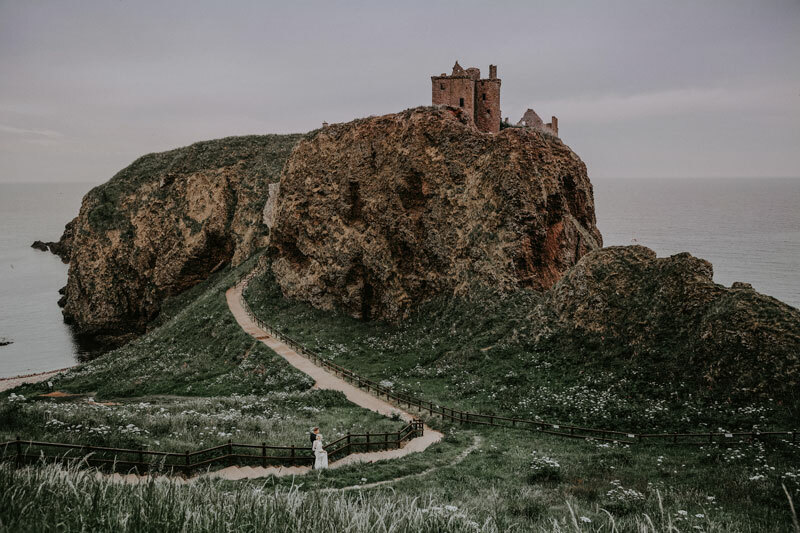 Having visited Dunnottar Castle a number of times in the past, I new just how wonderful a place this would be to do a shoot. 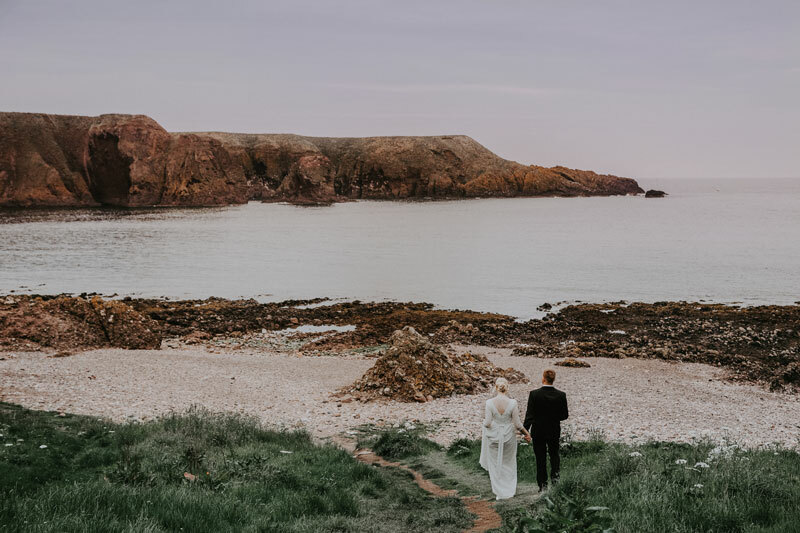 And as I imagine every wedding photographer in Aberdeen would be, I was really excited about the prospect of taking wedding photos here. 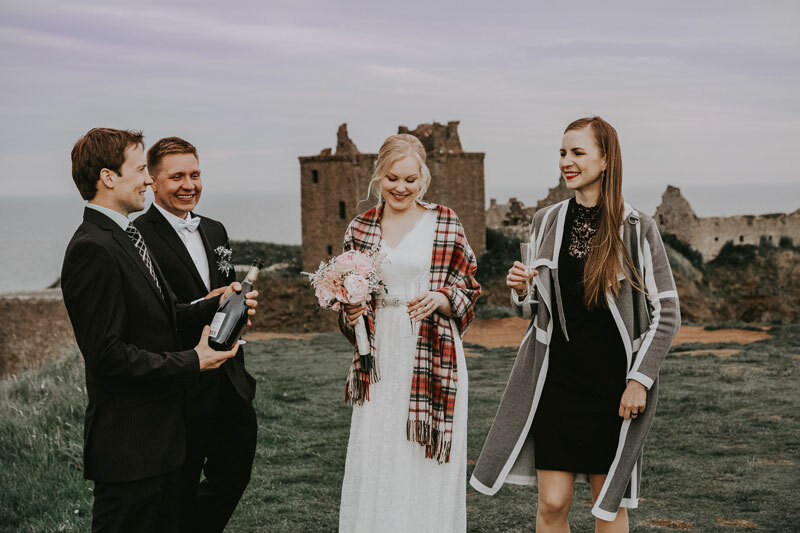 Let’s take a closer look at this stunning Dunnottar Castle Wedding. 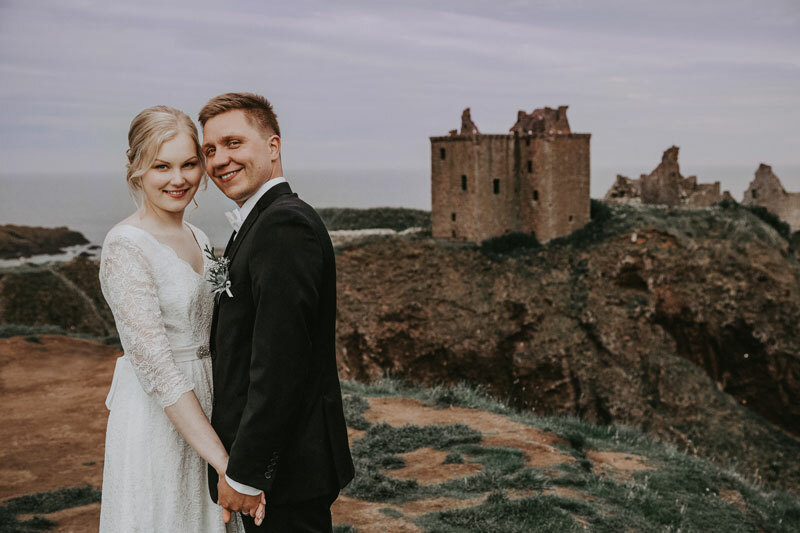 Niko and Milla traveled all the way from Finland to elope at Dunnottar Castle. 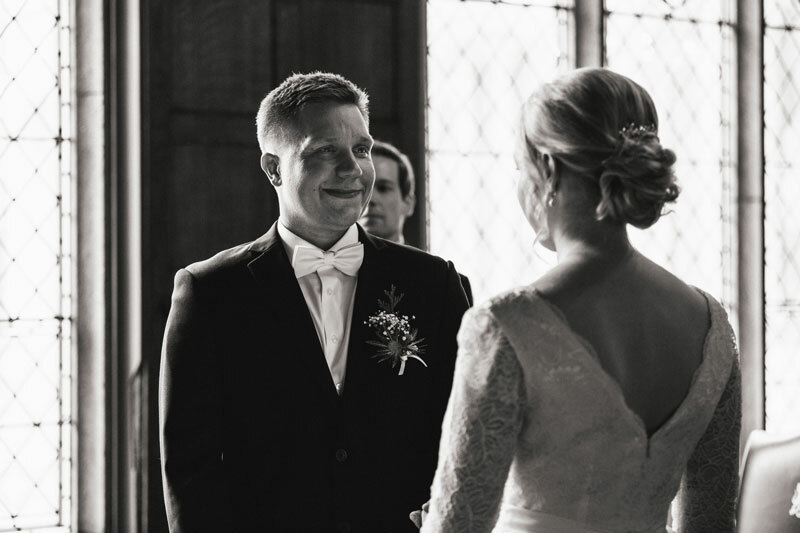 Their best friends joined them to make sure that their wedding celebration’s were unforgettable. 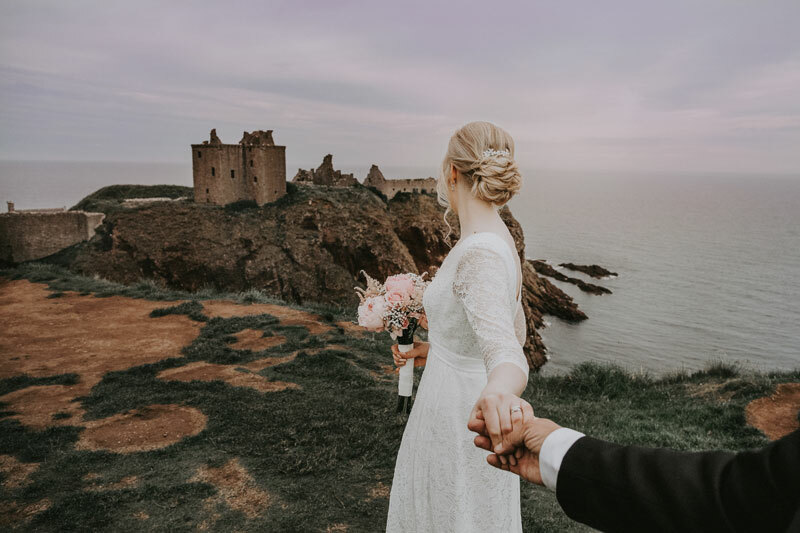 The ceremony took place at the imposing Marischal College. 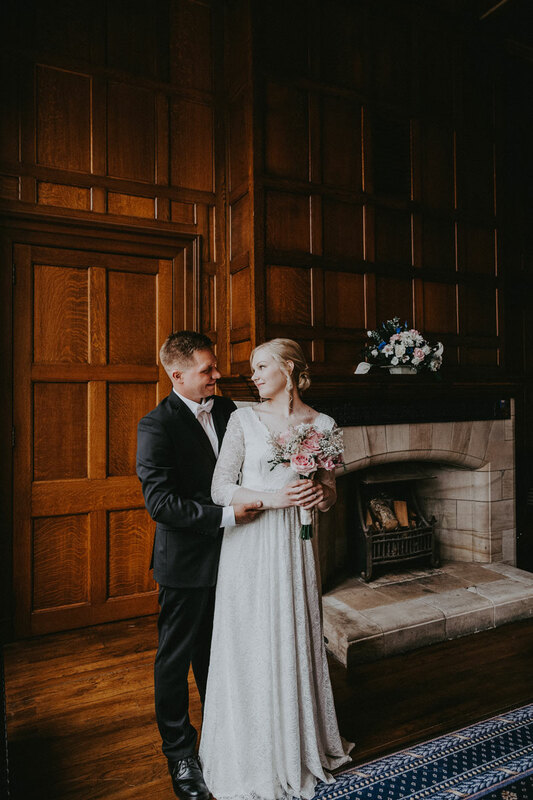 The big windows filled the Grant Room with natural light. And the stunning wood paneling and ornamental ceiling made this place feel very special. 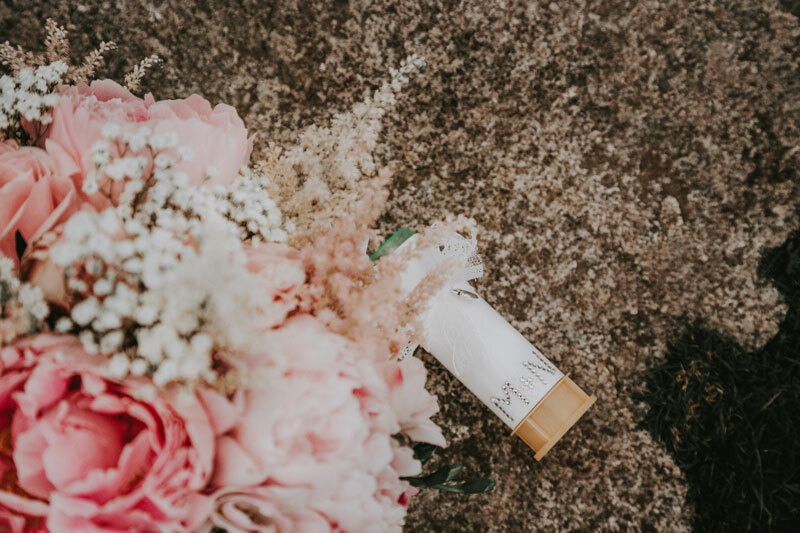 It’s also great for the wedding photographs. I’m sure you will all agree that Milla was looking stunning. 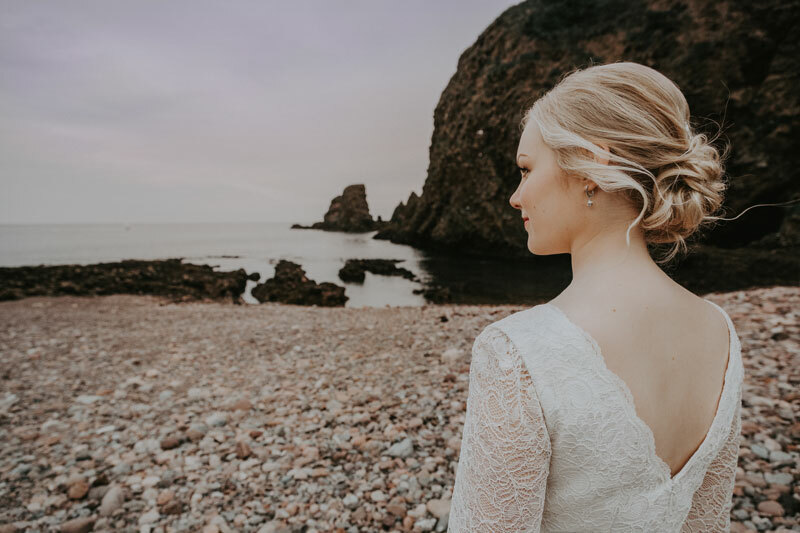 Helped in part by the great job done by Simone Said, who did her hair and make-up. 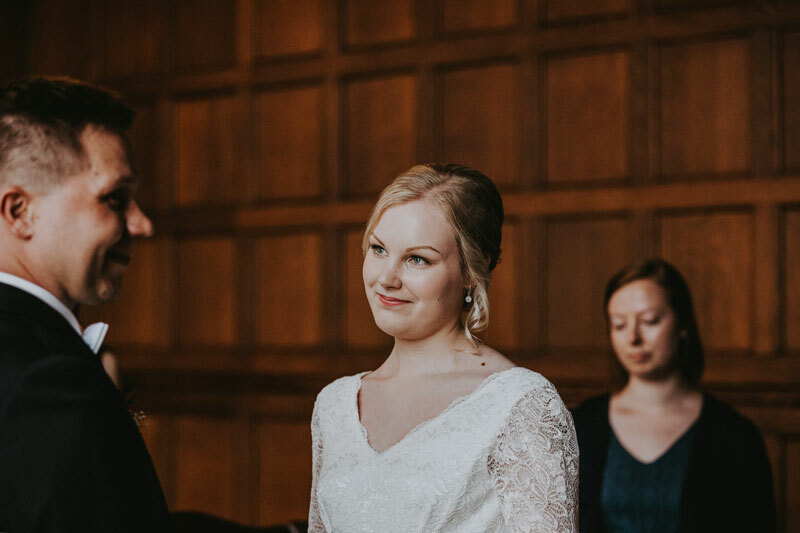 The beautiful wedding dress was designed by Studio Anne’s, and was bought in Finland. 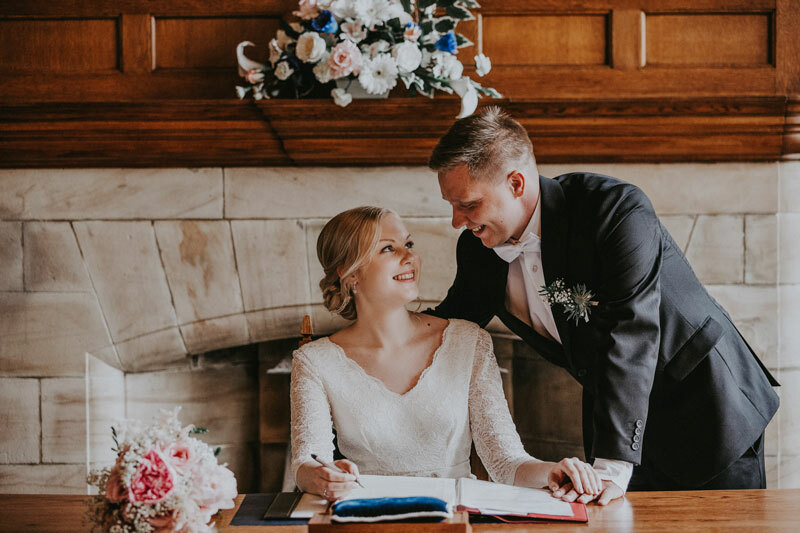 And the finishing touches were added by the florist Tracy Leiper who did the bouquet. 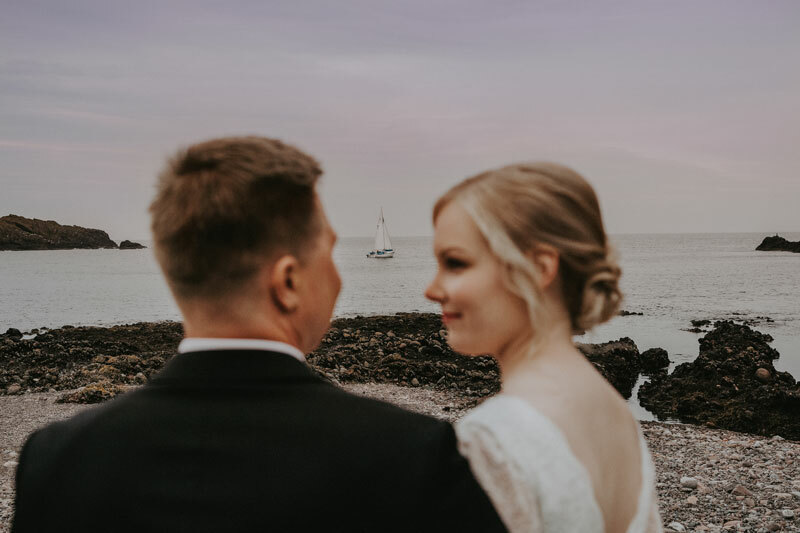 As a wedding photographer in Scotland I’m always a little worried about the weather. Especially in a situation like this, where all the images are going to be taken outside. 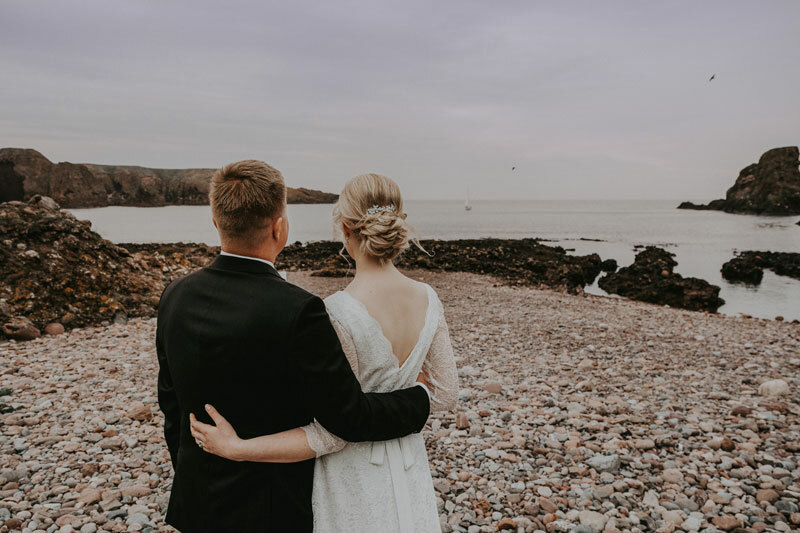 But on the day of Milla and Niko’s wedding, the weather was just perfect. 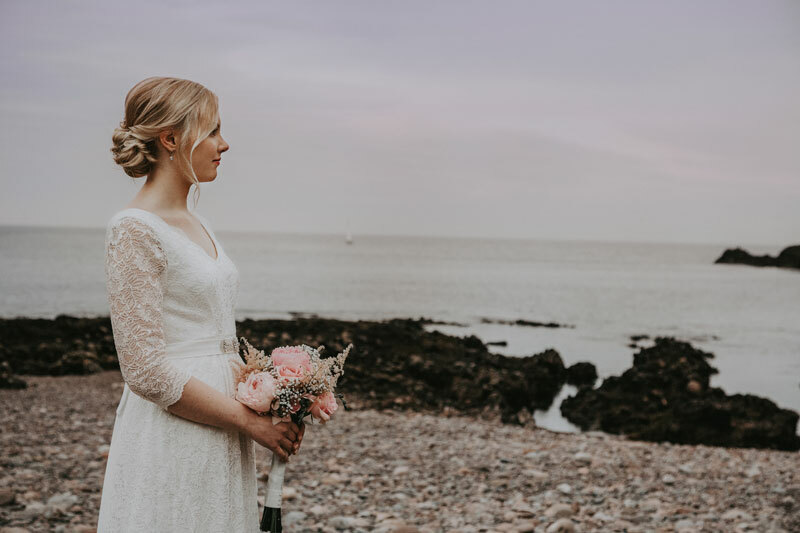 No wind and the sun stayed behind the clouds, which provided very beautiful soft light. 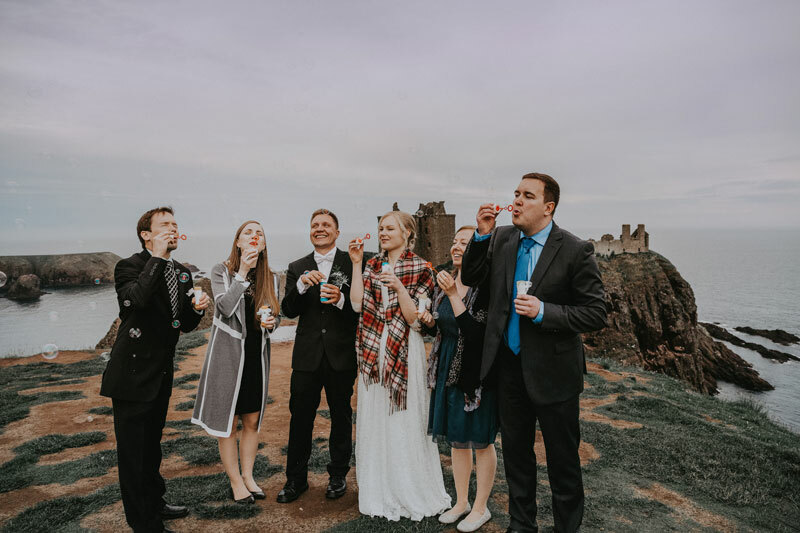 Whilst I was photographing their wedding day, the whole wedding party was enjoying some champagne and blowing some bubbles. 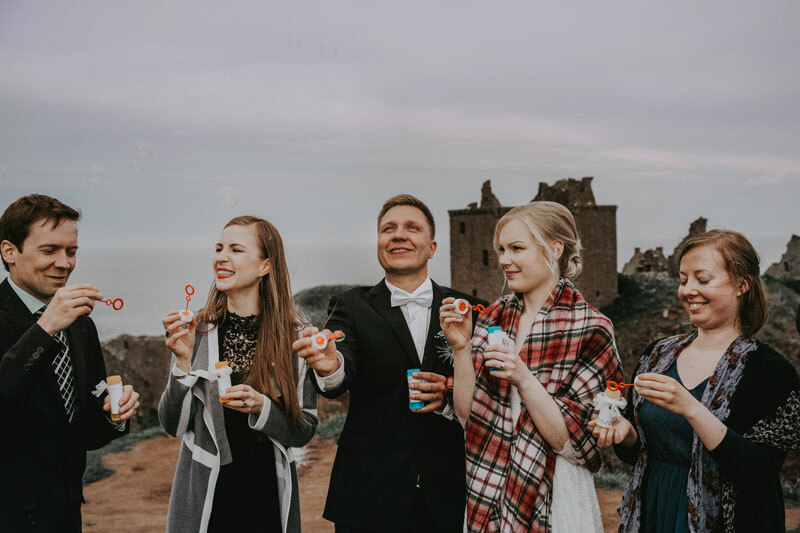 One of the great things about a Dunnottar Castle wedding, is you could quite literally spend the entire day here enjoying the views. And as the sun started to set, I managed to get a few last shots with the gorgeous soft pink sky in the background. The conditions were just perfect, and I think we were all really lucky that the rain stayed away. 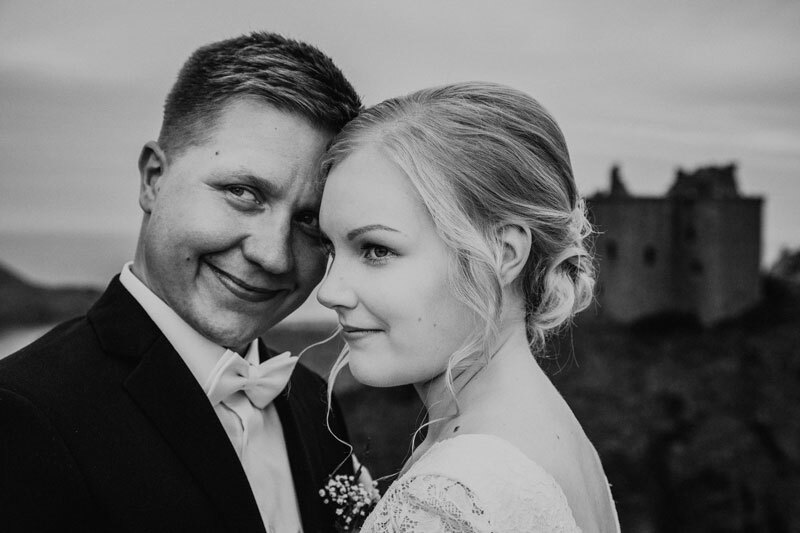 One of the best reasons to be a wedding photographer, is that you get to meet so many amazing people from so many amazing places. 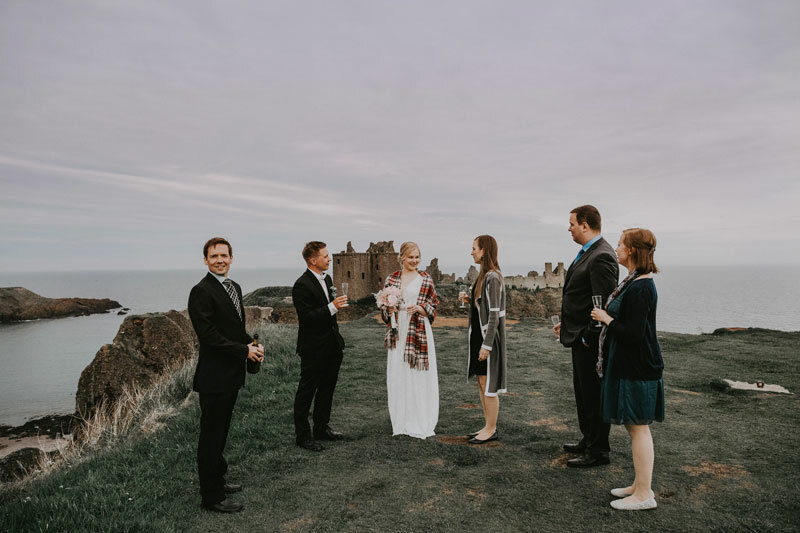 Milla and Niko’s Dunnottar Castle wedding was truly fantastic. With just their closest friends and a beautiful location. 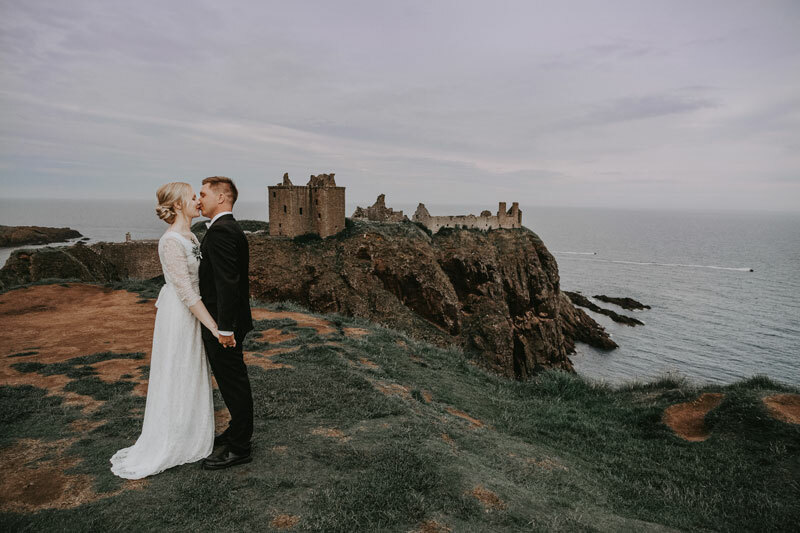 They are very warm and friendly people, and I was lucky that they choose me to be their wedding photographer in Scotland.